Sometimes after a weekend of nothing but Oysters you just want something beefy and cheesy. Oh, this hit the spot. I am so over summer and the only reason why is the heat – I hate the heat. I could deal with cold, rainy, snowy and/or cloudy weather every day, but the summer heat is something I could do without. It’s just not for me. However, as I write this I think of one awesome memory in the hot summer nights. It was the first time we decided to take our son for his first ice cream cone. The ice cream shop was full so we ended up sitting outside in the heat, thank goodness the sun was not out. It was so hot outside that the ice cream was literally melting all around our hands, we could not eat it fast enough – and if you know my husband, you know this is pretty amazing. If you don’t know him; he used to play football and is very efficient in his eating. We were laughing so hard and our son’s face was just a mess. It makes me smile just thinking about it. Thank you summer for that wonderful memory… but you can go now and let autumn begin, before my favorite and dear winter is here. This dish will be perfect for the colder months – or if you just want something beefy and cheesy. The recipe calls for roasted and peeled chiles, I bought canned but doing it yourself at home would give much more flavor. I will be making this one again, it was very easy to put together and tastes great reheated. Enjoy! Pour half of the batter into baking dish. Sprinkle with 1 cup of the cheese. Spoon beef mixture evenly over cheese. Enjoy with Pico de Gallo and Sour Cream! OMG wonderful and such mouth watering photos! Pancake mix? That is WAY too cool! Congratulations on your 24x24....I'm allergic to oysters, but it looked amazing! ....and your pup is the cutest! Looks so good. 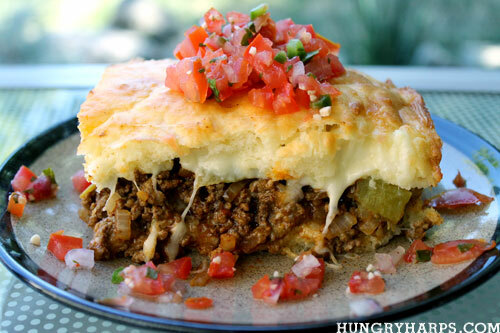 I've done something similar with a cornbread on top, but this looks like it would be lighter and fluffier than mine. Thanks for sharing! New follower. Love this post! I so echo your thoughts about hot weather. I HATE it and could live without it in my life forever! 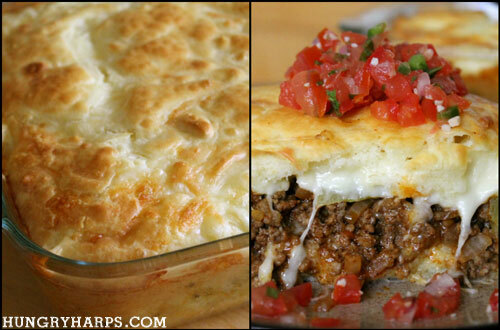 ♥ But I LOVE this recipe with its yummy beefy and cheesy goodness. ♥ Your photos do it justice.